Amwell Rotary Club is a part of the worldwide fellowship of Rotary Clubs that forms Rotary International. Although we do not have any formal twinning arrangements in place, we do have links with two of the Rotary Clubs established in Cluj-Napoca, Romania as well as with the Rotary Club of Phnom Penh, Cambodia. We have also undertaken joint initiatives with Hertford Shires Rotary Club to work with the Rotary Club of Sandton, South Africa on various projects. These are emergency tent units that can be sent from a central depot to disaster areas worldwide. Starting as the brainchild of one Rotarian with the support of his Rotary club in the year 2000, ShelterBox grew to become the largest Rotary Club project in the entire history of the organisation. Each box supplies an extended family of up to 10 people with a tent and lifesaving equipment to use while they are displaced or homeless. The contents are tailored depending on the nature and location of the disaster, with great care taken sourcing every item to ensure it is robust enough to be of lasting value. 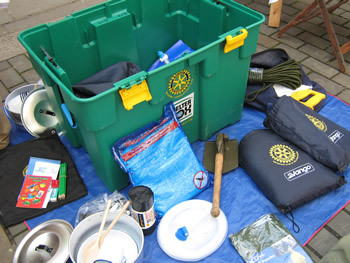 Highly trained ShelterBox Response Teams distribute boxes on the ground, working closely with local organisations, international aid agencies and Rotary clubs worldwide. 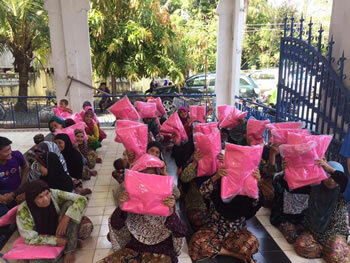 Working closely with our colleagues in the Rotary Club of Phnom Penh, Amwell Rotary Club have provided funds to purchase mosquito nets for distribution to various communities in their local area. These donations have been boosted by grants from the Rotary Foundation. 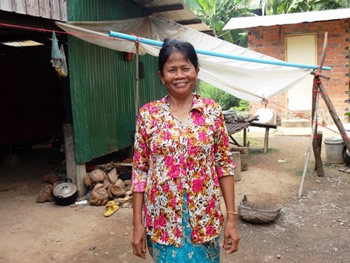 Amwell Rotary supports Lendwithcare which is a revolutionary way to help some of the world’s poorest people work their way out of poverty with dignity. See how Lendwithcare works HERE. Lendwithcare is an initiative of poverty fighting charity, CARE International UK. 100% of the money loaned through Lendwithcare goes to the entrepreneur. During the Rotary Year 2012 - 2013, we made a grant of £500.00 to the Itsoseng Community Clinic via our colleagues in the Sandton Rotary Club who have been coordinating this project. This followed on from previous donations to assist with equipping a community centre and a community garden. We have also recently joined forces with several other Rotary Clubs in District 1260 to secure a Rotary Foundation Global Grant which has funded a palliative care scheme in South Africa. So successful was this scheme it has now been adopted as the model for every Province in South Africa as well as by the National Department of Health. For several years now we have been collecting unwanted spectacles on behalf of Vision Aid. Along with other local Rotary Clubs, we have also collected unwanted hand tools on behalf of Tools For Self Reliance to be refurbished and then sent out to various self help projects around the world. We were full partners in the UK charity Convoy 2000 from the first Convoy in 2000 through to the final visits in 2004, Fourteen years later we continue to support projects in Romania with the Creative Learning Trust, the successor to the Clinical Science and Education Foundation. Most recently, we made a donation towards their work with autistic children in Transylvania.